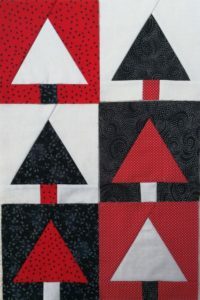 These blocks were how I like to make blocks – big and trim! I was also blown away by the fact that the triangles are perfectly equilateral! All that with no templates – yay! Thank you to Deana for the very-easy-to-follow pattern. My six for donation this month. Karen N in Cape Town.